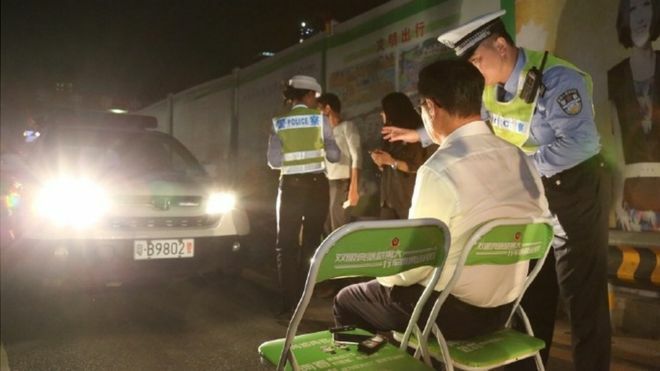 Police in southern China are punishing drivers who dazzle other road users with full-beam headlights by making them stare into the lights for a minute, it’s reported. Shenzhen Traffic Police posted photos of the campaign in action on their official Weibo account. “Tonight we are carrying out punishments using a high beam,” the post reads. It’s racked up 87,000 likes and been shared 93,000 times. The photos show people sitting directly in front of a car with its headlights on. Official media say drivers are fined 300 yuan ($44; £36) and made to spend 60 seconds in front of the beam. But some news websites have suggested that the headlight element is optional, although it’s unclear why people would choose it on top of paying a fine. The force faced criticism for a similar initiative in 2014, but nonetheless decided to start it up again on Tuesday. This time around, the reaction has been largely positive. Several other local police forces gave it the thumbs-up on their social media accounts, and a poll on the mainstream Sina news portal found that 90% of people approved. On the Weibo microblogging site, many people agree. “Am I the only one who thought a minute was too short?” reads one comment, which garnered 12,000 likes from other users. Another person feels the campaign is “long overdue”, while one berates “selfish, inconsiderate drivers”. A few people are concerned that the punishment could seriously damage eyesight, and one declares: “This is a human rights violation”. Shenzhen’s traffic police have opted for unconventional penalties before. Last year, they made jaywalkers choose between paying a fine or wearing a green hat and vest while directing traffic.